The Grand Venetian is a beautiful resort that is perfectly located on the beach in the heart of the hotel zone and is just a 10 minute drive from downtown Puerto Vallarta and the marina. The resort has amenities that include a fitness center, bar/lounge, stunning lobby, and a business/computer center that offers free internet access. Three enormous infinity pools overlooks the ocean, Downtown views and mountains and is complete with a full length wading pool perfect for children. This beautiful condo is located on the 4th floor and has an Ocean Front Stunning view!!! A comfortable king size bed with a top of the line mattress, pillows and fine linen sheets for your ultimate comfort! A luxurious bathroom with a large enclosed glass shower. The condo has a balcony with a private jacuzzi. The balcony allows you to truly enjoy the breathtaking sunsets and watch the fireworks every night! This unit has a fully equipped kitchen with granite counter-tops, a dining area, and large living room with flat screen TV and provides an incredible ocean view. Private internet. The one of a kind relaxing body contoured chair overlooking the ocean is so amazing you won't want to get up. Luxurious finishes abound as this unit comes finished with granite and marble bathrooms, flat-screen TV's, and a washer and dryer. Steps away is a new shopping plaza with excellent dining and boutique shops sure to entice everyone. Please click on the links below to see more pictures of this condo, the beautiful grounds of the Grand Venetian Lifestyle. 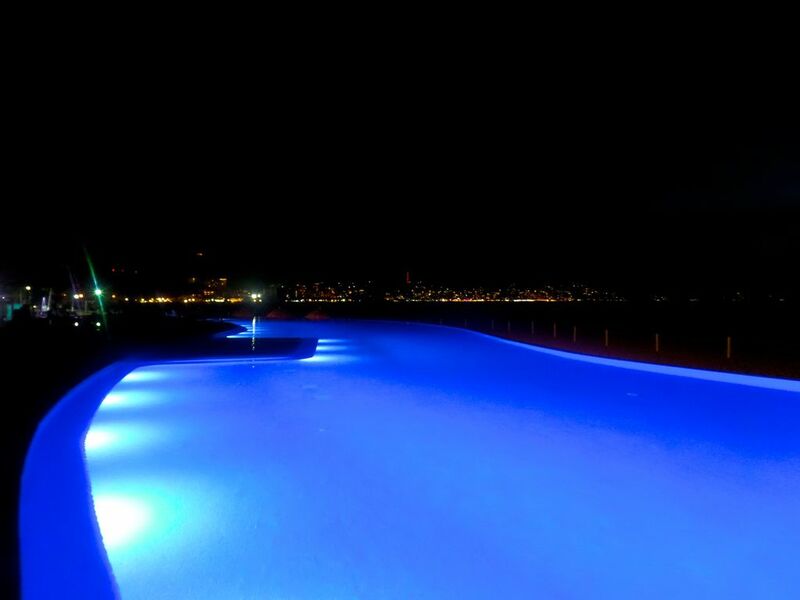 The Most Private Luxury Resort in Puerto Vallarta!!!! This unit includes maid service once per week. Our property manager will meet you on arrival for check-in and will provide you with two sets of keys to the condo during your stay. Upon departure, the two sets of keys will be collected and the condo will be inspected in order to refund your security/damage deposit. The Grand Venetian is perfectly located as there are unobstructed views of the ocean! It is so peaceful and beautiful words cannot describe. The grounds are perfectly manicured and there is an onsite gym among other amenities! The people that work at the Grand Venetian are so nice! Come and enjoy! You can hear the Ocean the best from this Unit!!! Amazing location of the condo, ocean front and beautiful, relaxing and peaceful! Nice size Balcony with amazing views! This was my first trip to Puerto Vallarta, and I was unsure of where to stay and what to do. The owner of this condo was VERY helpful. She gave me tips on what to see and good places to eat, and helped make my trip go as smoothly as possible. The condo is located in the Hotel Zone, so it is not far from the airport, and is surrounded by nice restaurants and stores. The view from the condo is unbelievable! There is a nice chaise lounge on the balcony that is the perfect place for an afternoon siesta. The view looks over 3 of the resort's 5 swimming pools and consists of beach, ocean and mountains. You also get a great view of the nightly fireworks right from the balcony! The resort is upscale and well maintained. There are nice loungers provided free to guests on the beach as well as by the pools. There is also a nice restaurant and beach bar. No car is needed, as many great places and grocery stores are walkable. In order to get to downtown, you can take the bus for 10 pesos, or a taxi, but I found that Uber was the best way to go. The cost to get down to the Malecon was only about $3.50, and I didn't need to worry about having pesos. I never waited more than 2 minutes for an Uber, making it very easy to get around town. I spent 8 days at this condo and it was very relaxing. Next time, I hope to stay longer! Due to the great location, I was able to maximize my beach time. On my last day, I left the beach at noon, caught my 2 o'clock flight and I was back in Chicago at 6pm! I highly recommend staying at this Grand Venetian condo, and I look forward to staying here again. We had a wonderful stay at the Grand Venetian condo's. The location is excellent and fairly close to grocery stores and Costco which is within walking distance. The pool area is spectacular, condo well equipped with everything you need for a wonderful stay. We loved having morning coffee on the balcony each day and sitting in the evening with a drink enjoying the view of PV Bay. The owner Elizabeth is very responsive and helpful. It was nice being only 4 floors up as we could easily come back to our unit for lunch and to bring refreshments down to the pool. Thanks for an awesome stay at your condo. Great condo, and great vacation! Property was the perfect size for the two of us. The bed was the most comfortable, and the fans and air conditioning made for the best sleeps after long days in the sun! Costco is in walking distance and a cheap taxi ride back so very easy to get groceries. The condo had everything that we needed, and the host checked on us to make sure we didn’t need anything else! We would definitely stay here again. Beautiful view of the ocean from our private patio. Thank you Rebecca!!! You both were wonderful guests to have!! So nice to keep in touch through trip!! I would highly recommend anyone renting to them they are gracious and kind!! The best renters you will find!! You are always welcome to stay here anytime!! This was a nice place for the two of us. The only things missing that would have been helpful were: water you could drink (had to go out and buy), dish washer soap (had to borrow some), and garbage bags. Otherwise this is a nice place. Sometimes a bit noisy with all the stuff going on at the beach and the number of kids using the pool. Great condo unit in a great facility with incredible views. We will definitely return. This is a small but well appointed one bedroom unit, perfect for a couple. The condo building has 4 large infinity pools, beautiful grounds and one of the nicest beaches in PV. Taxi ride downtown takes about 10 minutes and costs $5 to $6 US; less than $1US in the municipal bus and about an hour if you walk. Good restaurants, groceries, and shopping within a few blocks. Great location unless you want to be in the old town. We loved it and can recommend without hesitation. Grand Venetian is located in the Hotel Zone directly on the beach. The beach offers many activities very close by. Parasailing, Catamarans for rent, Jet skis, fishing, banana boat rides, massages on the beach, and so much more. Taxis and buses are readily accessible to take you downtown - about 10 minutes by cab - to the Malecon where stores, and bars, and restaurants are plentiful. Street performers and SO much more!